The most common application for our solid surface products is as a worktop in the kitchen or a vanity top in the bathroom. Virtually invisible seams mean limitless design possibility, as well as superior hygienic performance. There are no grout lines, caulked or epoxy joints (as with natural stone) to catch dirt and germs. And because solid surface is non-porous, bacteria and fungi will not grow on it. The salmonella that finds its way into most other surfaces will not last on solid surface. For this reason, solid surface and stainless steel are the only two surfaces that have received the NSF 31 approval for use in food preparation areas, and for ease of maintenance and cleanliness, are unmatched. Solid surface sinks come in a variety of shapes, sizes and colours, and when seamed to the countertop by an experienced fabricator, the final result is a work surface with no unsightly and unhygienic lip or ring. 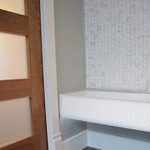 A fabricator can even craft a custom routed drain board or inlay designs in your sink or top! 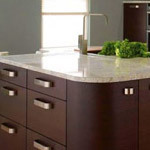 Solid surface countertops are becoming standard features on many new home projects as consumers discover what a wonderful and versatile product it is. Because it is unaffected by moisture, solid surface bath and shower walls are becoming an increasingly popular application. Solid surface does not support the growth of mould or mildew, ensuring a hygienic surface that is easily maintained with regular household cleaners. 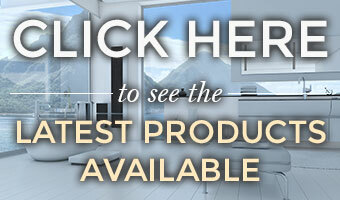 Imagine the ease of cleaning your bath or shower walls without the interruption of grout lines! With such a wide variety of patterns and colours to choose from, using a solid surface solution for your bathroom will provide a smooth and luxurious finish that can meet your exacting design specifications while still keeping functionality in mind.